I recently took on a second job, which has dramatically cut into the time I have available to cook meals. So I began to do some thinking about what the ideal and simple ready-to-eat meal would be. I naturally arrived at an egg based dish with lots of meat, green vegetables, and healthy fat. This frittata is very savory and can easily be enjoyed any time of day. The addition of coconut cream to the eggs really ups the fat and calorie content and lend a great sweetness to balance out the spices in the beef. This recipe would also be excellent prepared with Mexican spices and topped with fresh cilantro and avocado. Preaheat oven to 325 degrees and grease a 9×13 dish. Brown beef over medium heat on stove. Add spices, except for salt, and stir for 1 minute (taste and add additional spice if desired). Remove from heat. While beef is browning, steam or saute kale until tender. Beat eggs with coconut cream and salt. 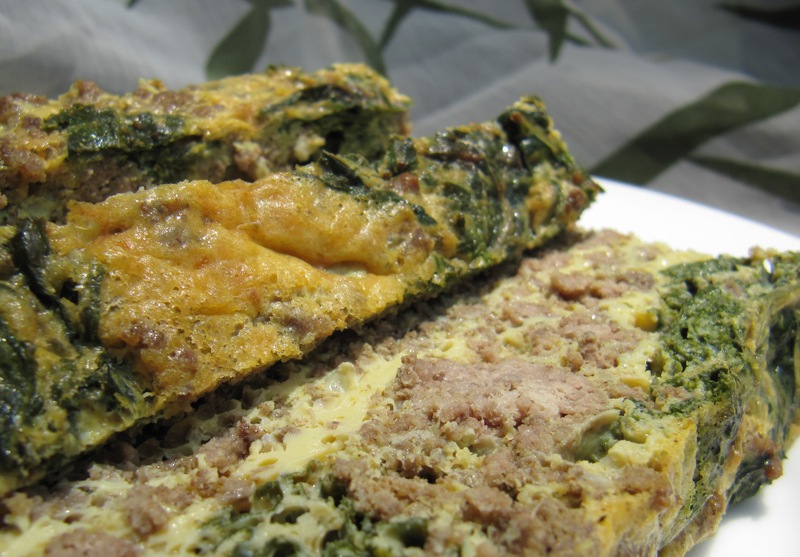 Put beef and kale into baking dish and pour eggs on top. Bake for 45 minutes to an hour or until center is set and top begins to brown. This entry was posted on Friday, July 8th, 2011 at 1:19 pm	and posted in Uncategorized. You can follow any responses to this entry through the RSS 2.0 feed.